Dr. Rajat Mishra, assistant professor in Stephen F. Austin State University's Rusche College of Business, has been named editor-in-chief of the Modern Project Management Journal by Modern Business Press, an online network of business, technology, computing and education journals. 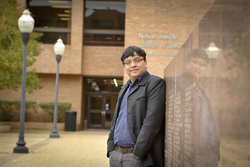 NACOGDOCHES, Texas - Dr. Rajat Mishra, assistant professor in Stephen F. Austin State University's Rusche College of Business, has been named editor-in-chief of the Modern Project Management Journal by Modern Business Press, an online network of business, technology, computing and education journals. The Modern Project Management Journal features the latest research on various areas of project management from scholars and practitioners around the world. Mishra explained the journal will "target papers from academicians and practitioners aimed toward bridging the gap between theory of project management and its implementation in the real world." Mishra has been teaching at SFA since 2014, and his research interests include strategic management, operations strategy research using panel data analysis, econometric models, corporate social responsibility and more. Additionally, Mishra serves on the editorial board and is a reviewer for the International Journal of Business Management and Business Quest. He is a reviewer for the International Journal of Quality and Reliability Management and is on the editorial board for the International Journal of Modern Management Sciences. "I believe research should inform teaching at multiple levels. Therefore, my association with these journals as editor, reviewer and editorial board member helps me inform my students about the current state of art and literature in the field," Mishra said. "It also helps motivate students to research and ultimately pursue studies beyond their current level."